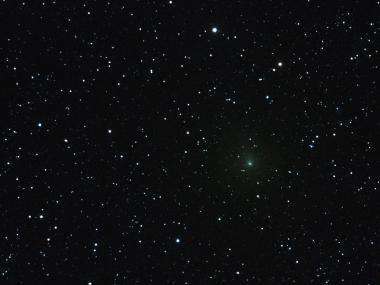 A pale green interloper among the stars of Cassiopeia, Comet Hartley 2 shines in this four-minute exposure taken on the night of Sept. 28, 2010, by NASA astronomer Bill Cooke. Still too faint to be seen with the unaided eye, the comet was 18 million miles away from Earth at the time. Cooke took this image using a telescope located near Mayhill, N.M., which he controlled via the Internet from his home computer in Huntsville, Ala.
Comet 103P/Hartley 2, a small periodic comet, was discovered in 1986 by Malcolm Hartley, an Australian astronomer. It orbits the sun about every 6.5 years, and on Oct. 20, the comet will make its closest approach to Earth since its discovery. In this case, "close" means 11 million miles, or 17.7 million kilometers. A moonless sky will make for promising viewing conditions in the northeastern skies, especially just before dawn.